The Horror Section: Getting It Right. The 8th annual Toronto After Dark Film Festival kicked off last Thursday with a screening of Jim Mickle's remake of We Are What We Are. After their mother suddenly dies, daughters Iris (Ambyr Childers) and Rose (Julia Garner) must carry on their family's tradition under the watchful eye of their ailing father (Bill Sage). My initial reaction to an American remake of Jorge Michel Grau's Mexican 2010 original was naturally disdain. However, when I heard Jim Mickle was adapting it, that gave me hope. After his previous two efforts (Mulberry Street & Stake Land), Mickle showed an uncanny knack for mixing character with genre. It seemed like a perfect fit. And it was. Mickle's We Are What We Are is almost flawless in its execution. When the original film was first released it drew comparisons to Tomas Alfredson's 2008 film Let The Right One In due its effortless fusion of genre with coming of age drama. Mickle's version shares the same vision, but takes it one step further. Whereas Let The Right One In's American counterpart (2010's Let Me In) was essentially the same story with a few tweaks, Mickle weaves a largely separate tale from the same jumping off point. By flipping the genders of the dead parent and eldest children, it created an entirely new dynamic that even, dare I say, bested its predecessor. He also delved into the origin of the family's practices, which though perhaps unnecessary, was not unwelcome. Julia Garner (left) & Ambyr Childers in We Are What We Are. What We Are takes it time and Mickle never loses sight of his main priority, which is family drama first, genre film second. This makes for a very slow pace – especially if you are already aware of the original and the pivotal family secret – but this is by no means a detriment to anyone who appreciates good storytelling. This film is also a treasure trove of great performances. Childers & Garner were both suberb in their roles and able to convey the inner conflict of their situation almost immediately. The dark unpredictability of Bill Sage's protrayal of the patriarchal Frank brought with a sizable presence, as well. The appearance of solid character actors Kelly McGillis & Michael Parks also lent immeasurable weight to the proceedings. There was an intense kitchen table scene between Parks & Sage toward the end of the film that had me on the edge of my seat. 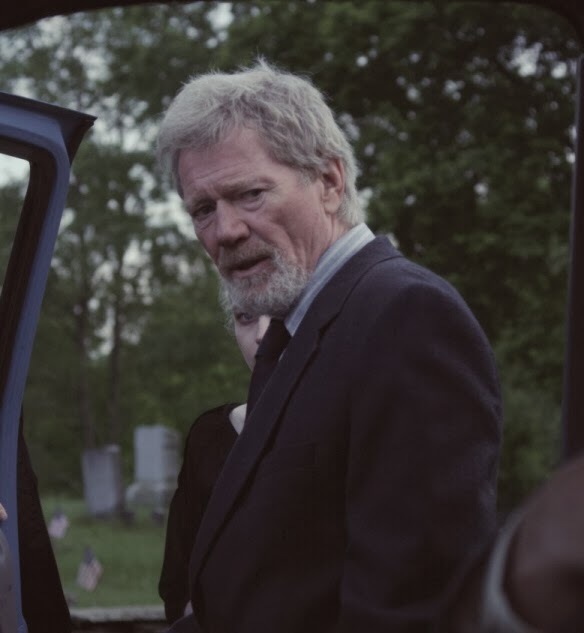 Michael Parks as Doc Barrow. In comparison with Grau's original, I feel the escalation was less pronounced, and Mickle's ending is clearly the more divisive of the two. There were several ways I expected this film to play out and I can safely say that what transpired was not one of them. It was truly a dinner scene to end all dinner scenes. Mickle, and his longtime collaborator Nick Damici, have now established themselves as solid voices in contemporary American film and I look forward to seeing where they go from here.